Sea Life Park Hawaii is where the heart meets the sea. Get ready to be inspired by our amazing marine animals during a show or by observing them in their habitats. If you're looking for a more unique experience, you can swim with Dolphins, Sharks, Sea Lions, or Hawaiian Rays. Whether you’re a hands-on thrill-seeker or prefer to view the excitement from a distance, Sea Life Park Hawaii will delight you. Join our 'ohana (family) at Oahu's only east-side lū'au as we take you on a voyage through Polynesia for an unforgettable evening of traditional music, dance, and cuisine where the Ko'olau mountain meets the moana. Participants learn about daily dolphin life and interact with them up close and personal in this intimate and educational adventure. 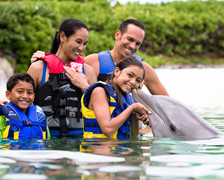 Guests touch, enjoy a kiss, belly ride and a single dorsal tow with a dolphin! NEW! This thrilling adventure now comes with a free dorsal fin ride photo of your memorable experience! More photos with your dolphin are available for purchase weather permitting. Dolphin Aloha lets you get close to dolphins without getting wet. At the backstage pool, you can pet and feed the dolphins and enjoy while they perform unique behaviors with splash and jump. Have fun interacting with our dolphin friends. Relax in our shaded, open-air theatre and be introduced to some of our amazing dolphins. Come with us on a wayfinding journey through island-style stories with an all-new musical score. The show is educational and engaging. Afterwards, you can feed the dolphins! Dolphin Feed $15, 12:30 pm daily. Times are subject to change. Questions? Call (808) 259-2500. Smart, fast and funny, our California sea lions are a pleasure to watch. You’ll be surprised and delighted by their underwater acrobatics and above-ground antics, plus you'll learn plenty! Times are subject to change. Questions? Call Sea Life Park at (808) 259-2500. Delve into the science of the sea in our unique interactive classroom and park environments. Hands-on learning is focused on the whole ocean ecosystem and its conservation. Students of all ages are engaged and inspired by our terrific team of educators. Life on the reef can be tricky. Come learn about some of the animals you can find on the Hawaiian reef including stingrays, whitetip reef sharks, and tropical reef fish! Children of all ages get excited about the Discovery Reef Touch Pool, where they can carefully lay their hands on sea stars, urchins, and even baby honu (Hawaiian green sea turtles). Crawl into the tunnel and watch the fish swim by. All creatures featured are native to Hawaiian waters and tide pools. *Touch Pool species subject to change. Penguins in Hawaii? Get up close to Humboldt Penguins at this exhibit where you can watch these flightless birds “fly” through the water. These animals are typically found in Chile and Peru so the Hawaiian weather is actually quite comfortable for them, and if they ever need to cool off they can always take a dip. A focus on conservation. 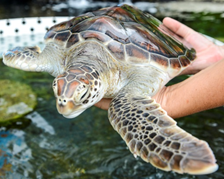 Come see the only active breeding colony of green sea turtles in the United States. As part of a resurgence to wild populations, the park releases between 200 and 800 green sea turtle hatch-lings each year. See them up-close and learn why they're such an important part of our ecosystem. Our crew of adorable Humboldt penguins are able to leap out of the water like bullets and walk upright. Hear all about the aquatic bird species during this trainer-led forum. Times are subject to change. Questions? Call Sea Life Park at (808) 259-2500. Experience the living shark exhibit, the Hawaiian Shark Cave. Step into the breathtaking world of Hawaii’s sharks, guided by dazzling interactive technology. This 300,000–gallon aquarium is home to native Hawaiian sharks. The exhibit includes sandbar sharks, whitetip reef sharks and a blacktip reef shark. Wholphins, like dolphins, have strong and long-lasting familial bonds, which makes sense given their genetic blend. A hybrid of a false killer whale and Atlantic bottlenose dolphin, Sea Life Park’s own Kekaimalu, meaning “from the peaceful sea,” and her calf Kawilikai, meaning “blend of the ocean,” are inseparable. Cockatiels and lovebirds make up the bustling, chirping community of Sea Life Park’s open-air aviary. All guests are welcome to step inside and enjoy their company during posted hours. Feeding sticks are available at no charge. Many birds have arrived at our park injured or sick, and in need of rehabilitation. We have carefully and lovingly nursed these beauties back to health and those that cannot go back into the wild are now permanent residents of Sea Life Park. Take a look at some of our local Hawaiian seabirds, including the Iwa (Great Frigate Bird). 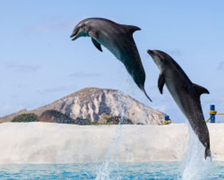 No amusement park in Honolulu will allow you to experience a variety of unique animal encounters and other interactive opportunities like Sea Life Park. From dolphins and sea lions, to sharks and Hawaiian rays, we provide you the opportunity to get up-close and personal with our animals in an intimate setting. Sea Life Park brings is truly, where the heart meets the sea! 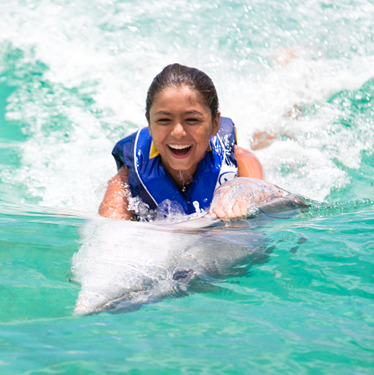 Some of the best family activities in Oahu are right here at Sea Life Park! We offer unique interactive opportunities and animal encounters such as dolphin encounters in Oahu. Immerse yourself among native Hawaiian sharks, learn about daily dolphin life and interact with them up close and personal, or even swim with a Sea Lion in a playful, educational, and interactive atmosphere! Dive into the science of our sea! 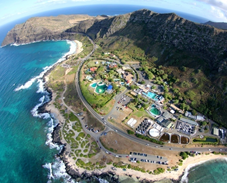 From Touch Pools, Penguin Trainer Talks and interactive classrooms, we offer some of the best educational attractions near Honolulu. Witness the award winning Ka Moana Luau and Interact one-on-one with the dancers as you experience first hand some of the most beloved traditions of the islands through interactive cultural activities including lei making, hula lessons, coconut-headband weaving, ukulele lessons and more!. Relax in our shaded, open-air theatre and watch the Dolphin Cove Show, or even touch starfish, urchins, and even baby honu! Our five habitats and exhibits are a great way to learn and observe the animal's behaviors! Step into the breathtaking world of Hawaii’s sharks, meet the youngest dolphin at Sea Life Park, say hello to penguins, or even feed a California Sea Lion! Our marine animal friends can't wait to meet you! 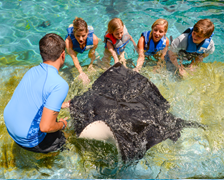 Plan your Sea Life Park visit with Tickets and Annual Passes and animal experiences. Don't forget to plan your dining experience ahead of time!